Okay...so I didn't just buy one pack of Stella and Rose paper from My Minds Eye, I treated myself to quite a few new goodies! I used MME papers from the Mabel line along with some stamps from Heartfelt Creations. For inspiration I used SSD Sketch 71. 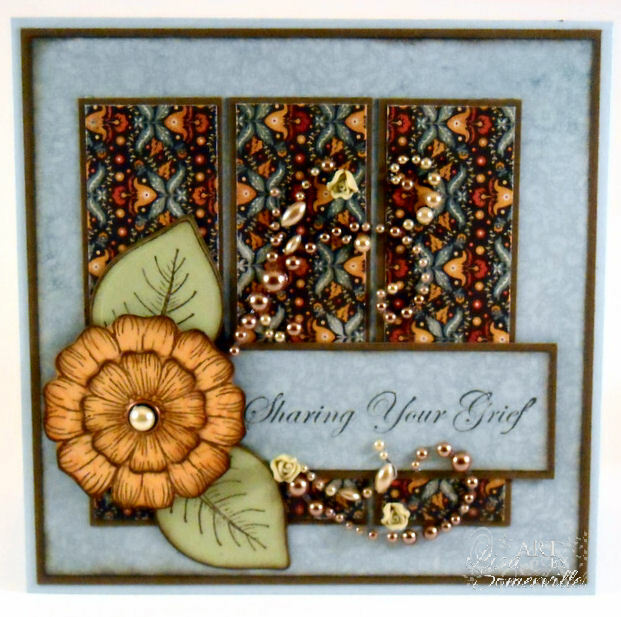 The Floral images are from Heartfelt Creations Flora Grande 1 and 2, stamped in Soft Suede on a scrap of MME Mabel paper, then cut with Spellbinders Blossoms 3 die. The Leaves are Heartfelt Creations Distressed Leaves, stamped in Suede on Celery and cut with Spellbinders Nested Leaves Die. I used the leftover Prima Flourish I had from yesterday's card. If you're looking for more Heartfelt Creations inspiration, stop by the company blog to see the beautiful creations by the other Design Team members. Today Heartfelt Creations is wishing a fond farewell to 9 of the current design team members: Clare Curcio, Debbie Seyer, Peggy Cain, Selma Stevenson, Gini Cagle, Linda Payne, Dee Jackson, Rosemary Dennis, and Anita Hovey. I wish you all the best with your future creative endeavors, I've enjoyed working with you for the past 6 months. I'll be popping by your blogs from time to time to see what you've been creating. I'm excited to continue working with the following Heartfelt Creations design team members for another 6 month term: Lisa Gregory, Angelica Turner, Kristina King, Olga Jewell, Cheryl Walker, Giovana Smith, Loretta Lock, Olena Levchenko, and Kerry Urbatch. I'd also like to welcome the 10 new design team finalists that will be joining the Heartfelt Creations design team for the next 6 months: Glenda Brooks, Therese Broman, Carla Suto, Lori Leng, Jan Hennings, Heidi Erickson, Lisa Lynne Wright, Marsha Sanderlin, Sue Walsh, and Joelle Hancox. Congrats Ladies, I'm looking foward to working with you! Lisa, I love your card! I just want to say I'm not an official follower but have followed your blog for some time now. You are on my list of blogs that I visit each and every morning! I'm so excited to be joining the DT and so look forward to working with you! Love this one, your flower is gorgeous! WOW what a beautiful card! Love the gorgeous rich colors on your card. Congrats on your continued term with HFC!! so Happy to see you are staying on with HC, because it just would not be the same without your talent! BTW, my previous DT sister and friend Jan made the HC DT! Beautiful card and as always the most perfect paper selection and embellishments! Love this! Lisa, this card is STUNNING! Gorgeous card, I love that dp and the bling looks awesome with it! This is gorgeous, Lisa! I love the DP and the bling! Perfect with the beautiful flower! I look forward to working with you on the HC DT! I just love the papers you have used here, the design and fantastic. Lisa, this is just gorgeous - I love these flowers and your colors are so rich! Thanks for the warm welcome, I'm looking forward to working with you again too! 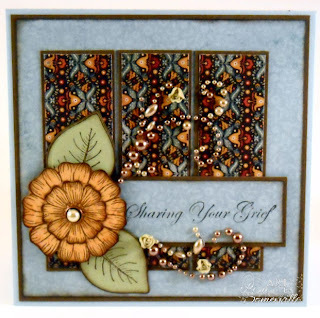 Wow, have we got some talent with this challenge this week, your card is just gorgeous, love the papers and the pretty flowers...so glad you're playing along at Skipping Stones Design. Gorgeous rich colors and lovely use of the sketch! The flourishes add such a nice touch to the composition. beautiful card Lisa, love the flowers and those MME papers are fabulous. As usual Lisa, your card is fabulous!! Thanks for playing along with us Skipping Stones Design! If you aren't already, please "like" us on Facebook and/or follow us Twitter, for more chances to win FREE SSD stamps!!! I hope to see your fabulous creations for this week's sketch! GORGEOUS card!!! Thanks for playing along with us over at SSD! super pretty card! Thanks for joining us over at Skipping Stones Design!